The Florida Keys, post-Irma, are still a mess, and could use your help. I’m not going to sugarcoat it – the Florida Keys are suffering badly from the damage caused by Hurricane Irma on September 10, and will be for months and months, maybe even years in some places. By now, I’m guessing the rest of the world isn’t hearing about it too much – there are so many other horrible things happening, after all. But if you’re a fan of the Keys – if you’ve loved visiting here, or maybe you’ve even lived here – don’t forget about the places and the people here. They need your help. Driving on US Highway 1 – the only road going through the Keys – is encouraging at some points, and a stark reminder of just how much work there still is to be done at most other points. Fran and I have been up and down US 1 between Key West and Marathon several times since we returned to Smartini on September 21. We’ve been doing various post-hurricane aid stuff several times each week, all along that stretch. Initially it was helping distribute much needed supplies (ice, water, food, diapers, etc., etc. ), and recently it’s been cleaning up yards and homes for individuals. 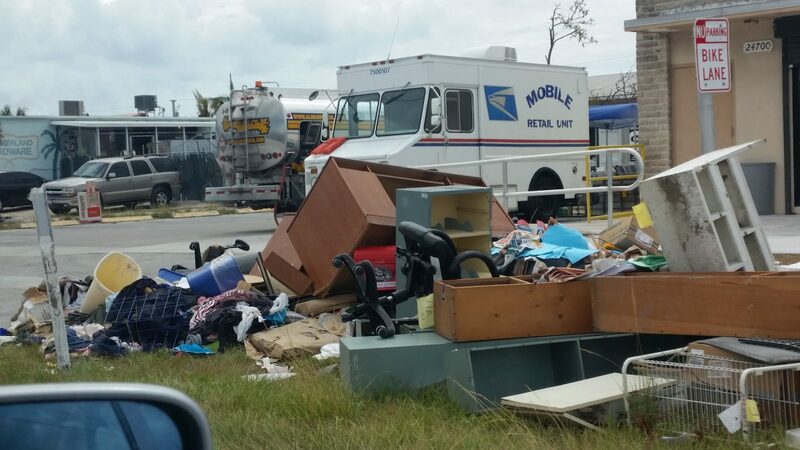 And every time we go somewhere, and get even 1/2 block away from US 1, we see it – the endless piles of debris, piled along every single street, representing the pre-Irma lives of thousands of people. In some neighborhoods, looking at the washers, dryers, water heaters, stoves and microwaves at the curb, you wonder if there’s a single home there that wasn’t destroyed. 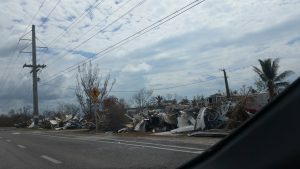 In Marathon, there is a mountain of debris at least twenty feet tall that looks like it’s the size of a football field. We heard that 160,000 cubic yards of debris has already been taken away – but you’d never know it. But the Keys are inhabited by a bunch of hardy folk, people not unaccustomed to hardship. The ones who’ve been here the longest seem to be the ones who are the least affected by it – they just put their heads down and do whatever is necessary to clean up and start moving back toward normal. And as soon as their own immediate needs are met, they start helping others do the same. 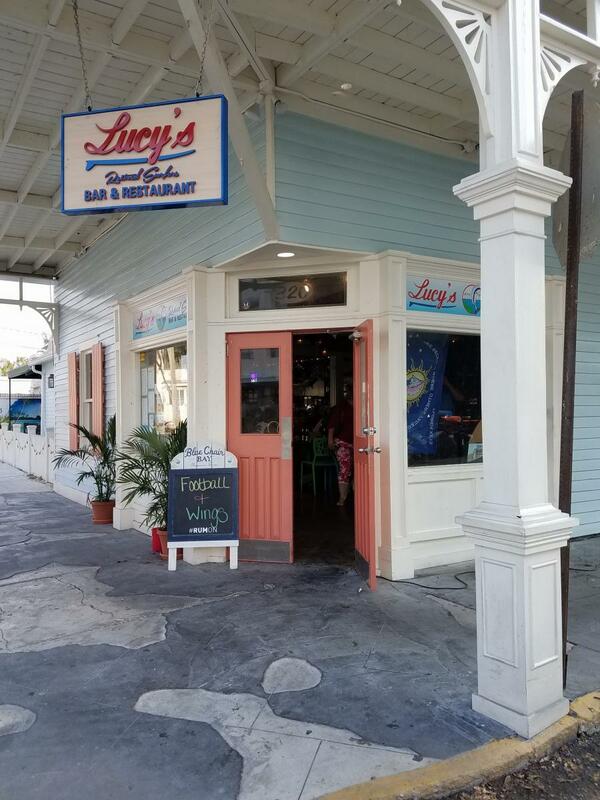 It’s not all bad news – Key West got lucky, and ended up on the good side of Irma. By being west of the eye (by about 15 – 20 miles), it was spared the strongest winds, which are usually on the northeast side of a hurricane’s eye. 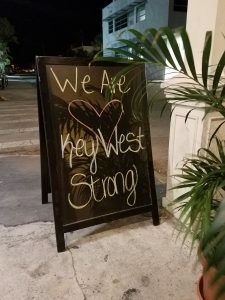 Although there are many, many destroyed homes here, and many more that are severely damaged, all in all, it’s much better than in the rest of the Lower Keys. Most businesses are open again – in fact, we were on Duvall Street last evening, and almost every storefront was open. Cruise ships – an important part of the economy here – started arriving early last week, and every one brings a much needed cash infusion to the businesses, and just as important, to the employees of those businesses. 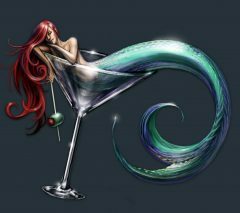 Speaking of employees – if you come to the Keys, for whatever reason – bring plenty of cash, and be prepared to spend it. There are so many people here whose normal life is paycheck-to-paycheck, and many of them have not had a paycheck since early September. Those who are back to work are, for the most part, back at less than normal hours, making less then normal wages and tips. The absolute best way for you to help with recovery in the Keys is to donate money to an appropriate organization. The second best way is to come for a visit and spend lots of money. Buy things you wouldn’t normally buy, go on an excursion you wouldn’t normally pay for, and by all means, tip the heck out of everyone you would normally tip. They all need it, and you’ll feel great doing it. I love your updates guys! Incredible work you are doing!! Miss you, too, Leanne. When you coming back to retrieve Caprice? You guys make everything fun. Even hell after a hurricane sounds like fun! Brian, you have another career just waiting for you as a writer. I always look forward to your updates.